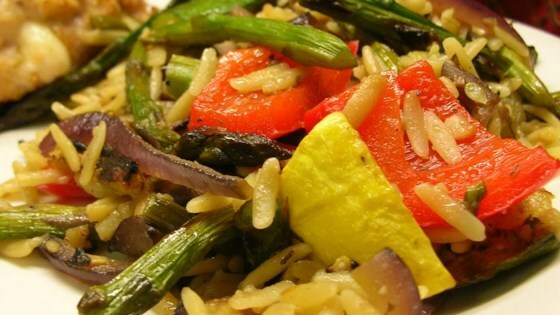 "This is a recipe I made up with all of the wonderful summer vegetables in season. Serve it with chicken or all on its own!" Meanwhile, bring a large pot of lightly salted water to boil. Add bouillon cubes, wine, and orzo, and cook until al dente, about 8 to 10 minutes. Drain. Stir in roasted vegetables and Parmesan cheese, and serve warm. This came out beautifully. I added fresh basil and parsley, which really enhanced the dish. This was great! It was super easy to make and extremely yummy. I added a bit of Mozzerella to the pasta. Perfect!